To get there, we will install and configure a new plugin and configure our job to use the plugin. 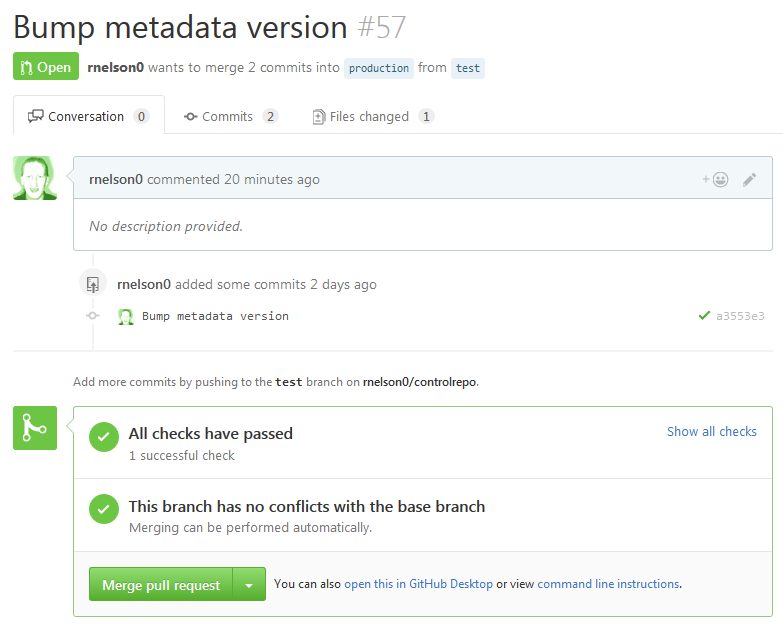 I’m finally getting back to Jenkins, which I started waaaay back in November (here and here). Unfortunately, I kind of forgot my password. Well, that’s embarrassing! I also want to redo the manifest using maestrodev/rvm which means starting over, so I need to back things up. The manual for Jenkins and the results on Google can be overwhelming sometimes, so I thought I’d share what I learned to hopefully save someone else. There’s a few ways I found to recover your password. One suggestion is to disable all security, delete your user, re-enable security and allow signups, and then recreate the same user and things should just “work”. Part of the reason you have to do this is that once you disable security, you can’t change the password for your user; only the user can. That’s … frustrating. Disable security by editing $JENKINS_HOME/config.xml, /var/lib/jenkins/config.xml on my instance. I was able to get away with disabling it by changing <useSecurity>true</useSecurity> to false, though the article suggests removing two other lines. Restart the service with systemctl restart jenkins or equivalent and now you’re able to get in and recreate some users. Last week, I discussed how to upgrade your Linux and Windows Puppet Enterprise agents with puppet_agent. Today, we will look at two different ways to upgrade your Puppet OpenSource agents, first with puppet_agent and then with jlambert121/puppet. There are many other modules that you can use to manage puppet, some of which offer similar functionality that you may be able to apply some of these lessons to. Why are we looking at two different modules today? I use jlambert121’s module to manage my puppetserver already. Unfortunately, it is puppet 4 only and I still had some puppet 3 agents hanging around according to puppetboard. I also have some other modules that are puppet 4 only, like the latest version of puppetlabs/ntp. I could use jlambert121/puppet to upgrade my agents that are already on puppet 4, but need something to help get my puppet 3 agents over the hump – that’s where puppet_agent comes in. We will start with that. Learn about Puppet module releases – via email! We’ve all found ourselves anxiously awaiting a new module release of our favorite puppet module on the forge. It might be coming down the pipe today, next month, or who knows when, but you’re going to need it as soon as it’s released. The forge fairly recently announced an RSS feed per module. You can see this in your RSS reader, if you use one, or get email notifications with a number of services, a few of which are mentioned in that blog. I have wanted to play with If This, Then That for a while, so I decided to see if I could figure out how to get emails through it. You’ll need an IFTTT account, at least one puppet module you want to receive alerts on, and of course an email address to receive the alert. Once you sign up for IFTTT, go to My Applets and choose New Applet. On the next page, it’s not obvious but click the +this text and it brings you to a selection page. Click on Feed, then New Feed Item. 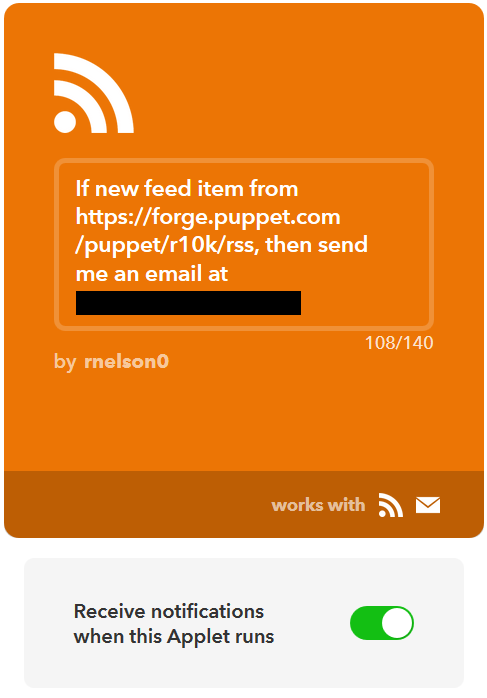 Now switch over to your target module on the forge and find the rss link. The pattern’s pretty easy, just add /rss to the module’s link. You can also view, update, and add additional applets using the IFTTT app for your phone or tablet. This might not be very pretty or exciting, but since I just want to get alerts without firing up an RSS reader, it’s good enough for me. Now to start updating my Puppetfile. Enjoy!